Using some parts designed for a wheel chair Payton and I made a harness to assist her sitting up straight in the new sidecar. It works. Now we will put some miles on it and see if any improvements are needed. l am unfamiliar with the myth so wondering what you meant. So are you saying that ABS works both with side car attached as well as with it disconnected. But always good to hear results from those who have experienced it. Az good to hear from you. 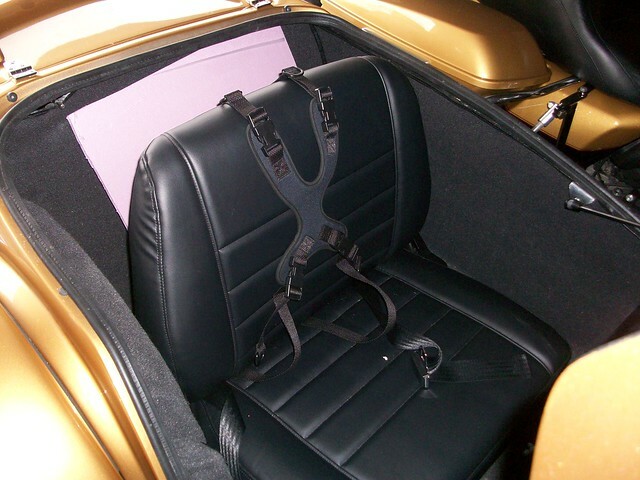 The unknowing were saying that once the sidecar was hooked into the system the ABS would no longer work. However it works perfectly with or with out the sidecar. The quick disconnect allow removal of the sidecar with out getting air in the system. I had expected a bit of a different free to the brake pedal , that is not the case either. Approaching 3,000 miles. Enough miles to check wear pattern on tires. Really good way to do this is ride slow over dust or sandy drive way or road and then on to hard road . Really works if you get it right. Front tire is prefect so far. Sidecar tire is a flat thread car tire, wear is favoring the inside 1/2 to 3/4 slightly. The bikes rear is slightly favoring the left side. While handling well this is not uncommon. A little adjust will be done on Monday. Some of the possible reason are simple. Lean angle it what both the Sidecar and bike are set at empty no rider. The bike is slightly 1-3 degrees left. That is so when rider mounts it returns to straight up. Weight of ride has some to do with how it is set . The sidecar is also set to lean slightly right to for about the same reasons. Once again after a good test it may need tweaking. If toe is out of adjustment the results are cross wear and handling issues. Toe seems fine. SWAG tells me take 1 degree out of each and go. It has been a journey installing a sidecar on the RGU. No regrets all the home work paid off and things went well and on budget. As with all projects always something that could have been done different. While the sidecar was being installed I had a new Motorcycle tire installed on the rear of the bike. Should have just went with the Car tire right away. In defense I was was not finished collecting the information I needed and had I done it then it would have been the wrong size. The budget gave us a complete rig that did everything it should do right and made the setup one I could remove the sidecar if I wanted. After about 4,000 mile of getting to know the rig it was clear. It is staying on all the time. Also decided to spend a little more on it and added a reverse. I have plans for some lights for the inside of the bags next and a radio for the Grandchildren in the sidecar. In the big picture small stuff. Some of the cost maybe should not be figured in like tires you need them any way but I did include them. The Tuner was not necessary , something I wanted so it is in the numbers. Unlike some peoples point of view the local HD dealer I go to was a big help. Their life times of experience with bikes was a big help and helped avoid mistakes. Shipping the sidecar to them and having them install it was the right call. The work to the bike front end was just right, Contrary to all the HD can't do it right crap I got. 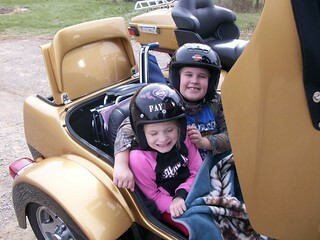 However do not have a shop not experienced with sidecars do it. Cost, this was never intended to be a cheap venture. My other one is a budget job. This one had to be right and have everything. As of now including the bike at trip to Murry KY to visit Hannigan the cash spend is at $47,000. Sounds like a lot but when you go over the list of every detail not that bad. Heck a new trike is at $37,000 and we all know you spend more on it. Also a trike would never have met the reason this was done. Sidecar is not for everyone, not every build needs to be as costly. If it is something you are considering. Do your home work. Listen to proven pro's not back alley frauds. Ignore the "they say" talk. Some things are black and white others have more than one approach. If you shop right you can some times find a complete rig used at a great deal. But don't settle for less than your heart calls out for. Pretty much done with the thread for now. Spring will come soon and some adventures are planned. About 5 weeks from now TN here it comes and ride over the missing Link bridge among other things. If you have question about anything that was done just ask. And others that while they chose not to post they offered ideas and information Via private emails. There will be a new thread. Some time in the next couple months I will be helping a person that has jumped in on sidecars install his first one. He has the hack and the bike it is going on all we need now is clear weather to get it all here. Last edited by smitty901; 03-07-2019 at 06:30 AM. I have often said Your Call and Your Money, and if you are happy would consider it money well spent, and wish you many miles and smiles ..
Clearly was well spent. The rig is here to stay. There could always be a chance the tug gets replaced but it would be another RGU. But like the EVO FB this one is a keeper. 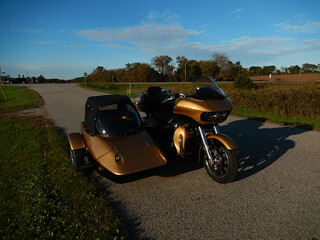 I could have purchased a 2104 low miles Indian with a Hannigan Heritage sidecar for $23,000. But it was not what I wanted and settling just was not setting right with me. Also the Rig had had some short cuts taken I would have had to correct anyway. Another older model BMW with Hannigan twin Classic was spotless but again to many short cuts . BMW need major front end work to get them right they had skipped that. You get to a point in life where you do get to have it your way. Last edited by smitty901; 03-08-2019 at 05:02 AM. Looking forward to following your travels. And not settling on other options removes any thoughts of "it's OK but l wish l would have...." running through your mind.